Ever since Indian restaurants began opening in Britain, curries have been modified to suit local tastes. Some, such as Chicken Tikka Masala and Baltis, were invented here. Now there's another one, from Glasgow this time. Chasni has been described as 'Indian food for people who don't like Indian food'. It really is the blandest thing on the menu, but you'll love it. Your chicken should be boneless and skinless. Chop it into bite-sized chunks. In a bowl, mix the juice of 1 lemon with a quarter teaspoon of turmeric and a pinch of salt. Add the chicken, and stir to get it all coated. Leave it to marinate in the fridge for about 20 minutes while you make the sauce. Peel and finely chop the onion. Lightly sauté it in oil for about 5 minutes, until soft and transparent, but not browned. Add the ginger and garlic, and let it sizzle for 30 seconds, then add the cumin and paprika and cook for another minute. Add the chopped tomatoes and the finely chopped coriander (save a bit for garnish at the end). Add water, stock or coconut milk and cook for about 5 minutes. Put the sauce base into a blender, add the mango chutney, tomato ketchup and mint sauce and whizz for about a minute until it's really smooth. Drain the chicken from the marinade and sauté in a little oil until browned. Stir in the sauce and let it cook away until the chicken is fully cooked through - about 10 - 15 minutes. Stir in a little cream, add salt and pepper if needed. 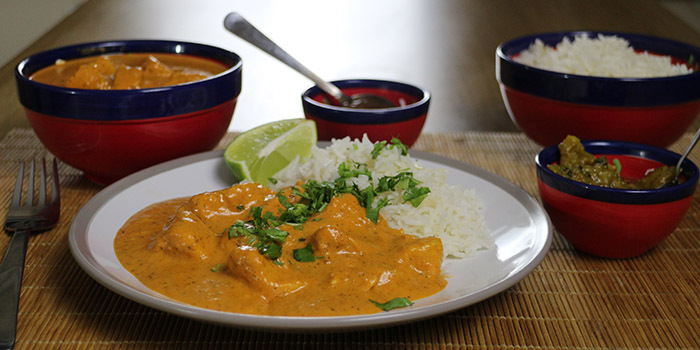 Serve with rice, naan or chips, a sprinkle of coriander and a squeeze of lime. The video above is from the Keef Cooks YouTube channel. Click here to see the video recipe of Chicken Chasni on YouTube. Prep time: 10 minutes. Marinading time: 10 minutes.